Transport Models - NFS column on it's way. NFS column on it's way. A National Fire Service column sets off towards the docks following a bomb attack in 1942. Fire appliances are 1/76 Oxford Diecast models. The dispatch riders come from the Airfix RAF recovery set. Pete, your dioramas get better and better, but I think I have spotted the deliberate error in this one straight away. I am sure that there were no double white lines on the roads in 1942. When are you going to tell us all what you thought was incorrect in that airfield scene? Best Wishes for Christmas and the New Year to you and all fire engine modellers. Added by George Illingworth on 22 December 2013. Great looking models and clever use of motorcycles. Shame the road markings are so bold and modern as they detract from the overall effect. Nice work, I always think models are better displayed in settings. Added by Ray BENNETT on 22 December 2013. Road markings began appearing on British roads in the 1920's, the first Ministry of Transport guidelines being published in 1926. Added by Mel Turbutt on 22 December 2013. Added by Ted Angus on 22 December 2013. 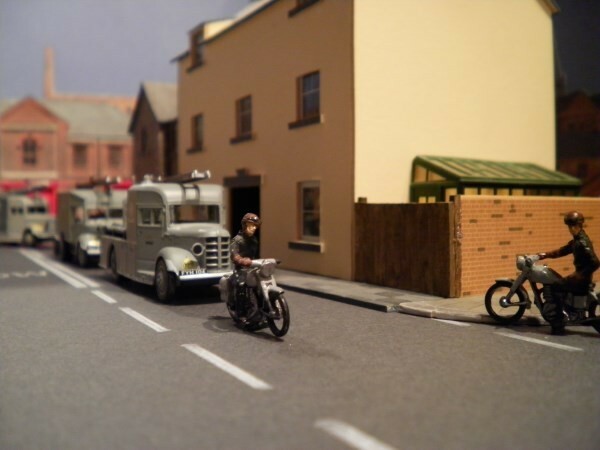 I like this one Mel, especially the out-riders leading the mobile column to the scene at the docks.Also, that building on the right looks really very nice, is it a kit or scratch built?. Added by Pete Matten on 22 December 2013. Mel, my apologies. I have got so used to Pete producing NFS dioramas that I never looked at the name. At this time of year Pete would have produced it covered in snow to hide the road markings. You are right that white lines were introduced in the 1920s but double white lines were not introduced until 1957. I was building Meccano fire engines at the time. The building on the right is indeed very effective. What are its origins? Added by George Illingworth on 23 December 2013. It's scratch built Pete. It's a hotel that was originally part of a model railway and the front face seen in the photo couldn't be seen, so the rear has better detailing. I'm planning to use it to display as an NFS sub-station, but some of the vehicles I'm planning to use won't arrive until Santa brings them. Added by Mel Turbutt on 23 December 2013.